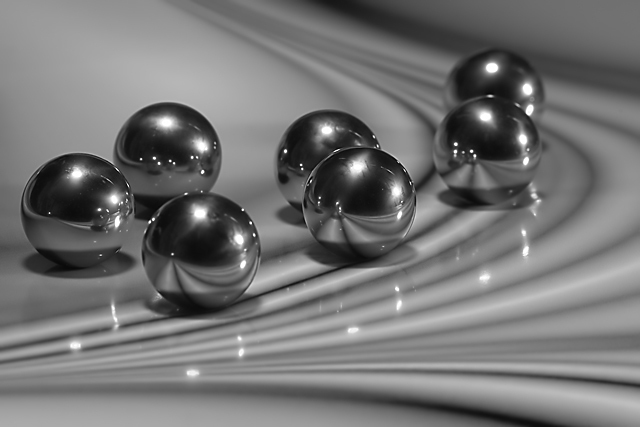 Chromed steel balls on a sheet of glossy printer paper with an abstract image printed on it. Congrats, Mick, super shot and liked the pun too. One of my top picks. Congrats. on a nice finish. Message edited by author 2006-01-11 23:28:12. Cool Title! Cool image! Congrats! A fantastic capture of these cold hard beauties. Congratulations on your top 5 finish. Hurrah Mick for a fine fifth! Lovely creative way to present shapes to our eye. Pacific NW showed up well in this top 10! Well done Mick! Congratulations on 5th! 7 - Like this. Toning works well. Reflection seems good. Criticism; not much, perhaps a fraction sharper may have helped this in my opinion. Innovative image which does well with the challenge theme. Terrific focus and DOF. Well composed. Interesting as it raises more questions than it answers. Well done. Hope it ribbons! Love it! Love the title!! Nice composition...GREAT line. The highlights are good, but best of all, the contrast is good on this B&W shot. Nice job. Beautiful shot--I love the light reflection. Fits the challenge perfectly. Lovely lines and reflections, elegant and effective. A little more brightness might be better. My kinda image. I like it. Color would have been nicer though. Amazing metallic feeling and composition. Very eye catching even without the colour! literally, takes my breath away. great curves and lines. great tones. just awesome and great! 10 from me! Nice! Love the lines! Marbles could have been shinier though :) 8! Love how the title cleverly relates to the photo. The ball bearings are in wonderfully sharp focus. Not only are there curves seen in the spherical curves of the Bearings but the eye is also drawn to the curve/grove/track that the bearings are traveling upon. Fits the theme and great reflection and light, too. Proudly hosted by Sargasso Networks. Current Server Time: 04/26/2019 09:40:44 AM EDT.